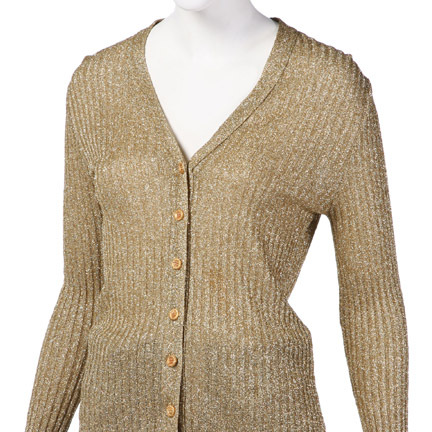 This costume was worn by the character "Ginger McKenna" portrayed by actress Sharon Stone, in the 1995 motion picture, "Casino." 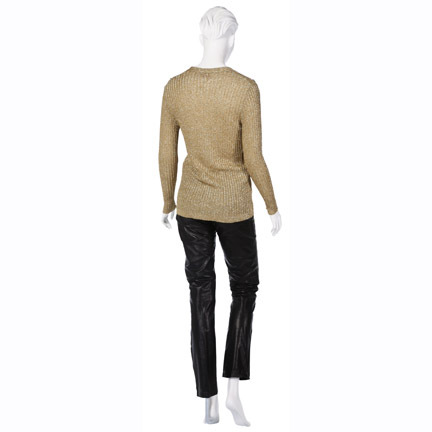 The outfit consists of a vintage gold Lurex button front long sleeve cardigan by Oscar de la Renta and black leather pants with ankle zippers. Ms. Stone wore this outfit towards the latter half of the picture when Ginger meets with "Nicky Santoro" (Joe Pesci) and complains about her husband "Sam Rothstein" (Robert De Niro) not allowing her to retrieve her jewelry from the bank after she left him. She seeks Nicky's protection/sponsorship in return for sexual favors. The majority of Stone's wardrobe used in the film was custom designed by Bob Mackie and has not become available for sale, making these vintage screen worn garments highly collectible key pieces from the production. Sharon Stone was nominated for an Academy Award for Best Leading Actress for her outstanding performance in the film. 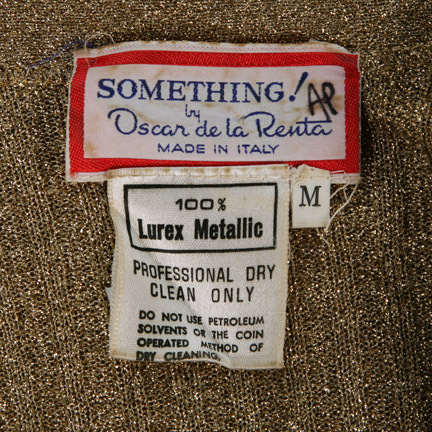 Both garments are in excellent screen worn condition and are accompanied by a letter of authenticity from the costume house. Presented by The Golden Closet, your premier source for iconic screen used wardrobe, props, and music entertainment memorabilia.